After successfully assigning women train ticket examiners (TTEs) in the Bandra- Surat Intercity Express, Western Railway (WR) has now posted them on the premium Mumbai-Ahmedabad Shatabdi Express. WR officials say earnings in the Intercity Express have increased 300% after the women staff took over. Seven women TTEs have been selected for the 18-coach Shatabdi Express, and two of whom will be in charge of four coaches every day. In the Intercity Express, two of the 25 women TTEs are in charge of four coaches every day. Aarti Singh Parihar, WR senior divisional commercial manager, said, “We feel that all are equal and women should be given the responsibilities and jobs currently done only by male staff. 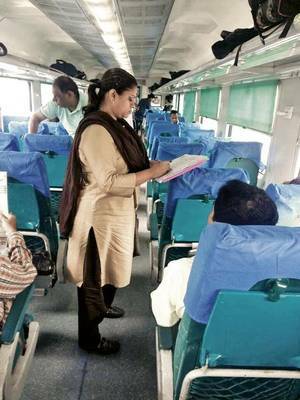 Women ticket checking staff can be role models for young girls, and they can give confidence to our women passengers.” WR officials said they had been planning to introduce women TTEs in the Shatabdi Express for long. But because of the long hours, they were first assigned to the Intercity Express. A senior official said, “We wanted to first check the feasibility of sending women staff on long-distance routes. Initially, there were issues raised by the staff members, but they are now happily working on the long-distance trains.” The women staff started checking tickets in the Intercity Express in March, on the occasion of Women’s Day. But WR had to face a huge protest by the women TTEs who were upset with the Mumbai division. “We had written to the General Manager asking him not to assign women ticket checking staff to long-distance trains, as we face many problems when it comes to family and children. We were in local trains, but now we are following the rules set by senior officials,” said a woman TTE who was part of the protest but did not want to be named.